One of the best ways to maximize your money when it comes to a you are planning to buy is to purchase it through. You’ll get a nice bonus for doing so, often as many as 200 Swagbucks or more! Yesterday, when the hot eBay Groupon deal appeared, many of you were asking how to get it through since you couldn’t find it on the Swagbucks homepage. I didn’t know the answer, but left a short explanation of how to do it in the comments. I realized that this was a tip many of you might not see buried in the comments, so I asked her to write up a post about it. So, here’s how you can earn by buying Groupon deals through the Swagbucks Daily Deal Tab, even ifthe actual Groupon deal you want to buy is not listed as a deal on Swagbucks! 1. Go to your and click on “Daily Deals.” 2. Click on any Groupon deal (it doesn’t matter which, just click on a random deal). 3. Click “Continue” on the next page, and you will be redirected to Groupon. 4. When you get to Groupon, make sure there’s a white bar at the top of the screen that says “trialpay”. Trialpay is Swagbucks’ affiliate site which tracks your transaction so that you can get credited your Swagbucks. You want to make sure this is showing up, otherwise you won’t get credited for your purchase. It is very important that the white trialpay bar stays there until you have completed your transaction. If the white trialpay bar disappears at any time, you need to start over at Step 1. You have followed all the steps above and are now at Groupon. But you don’t want to buy that deal, you want to buy the eBay deal or a deal listed in another city/state. In your address bar you will see a URL like this in your browser: www.groupon.com/deals/candy-man?utm_source=aatrialpay&affliae_id=trialpay&subid=U102070854 5. Open up a second window and pull up the page of the deal you’re wanting to purchase. Go to the purchase page and find the words in your browser which are between deals/………/confirmation. This is usually one word or phrase which describes the name of the company offering the Groupon deal. 6. Copy and paste the word or phrase from the purchase page into the section here: deals/………?utm_source of the URL on the trialpay window you left open in step 4. For instance, the current eBay deal can be found at www.groupon.com/deals/ebay. So, you’ll change the words in between deals/………?utm_source to eBay and hit enter. Leave the rest of the the address alone as that is the information trialpay needs! After hitting enter, it should open up the eBay deal page (or whatever deal you’re trying to purchase) with a trialpay bar at the top of the page: www.groupon.com/deals/ebay?utm_source=aatrialpay&affliae_id=trialpay&subid=U102070854 So now, you still see the trialpay bar (which means you should get your swagbucks credited), and you are at the eBay purchase page! Click “buy”, and you are done! 7. 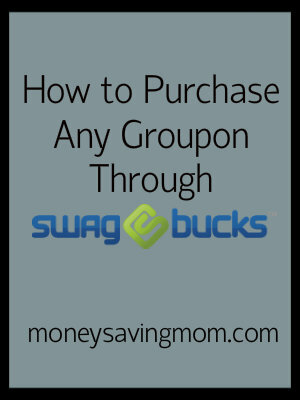 Purchase your Groupon and your Swagbucks should be credited almost instantly! I have done this numerous times (including the eBay deal) and have gotten my Swagbucks credited in just a minute or two and have gotten my confirmation email and Groupon deal credited to my account. A huge thank you to for sharing all the details and information for this post! I did this yesterday and I actually still have my confirmation window up in case I didn’t get my swagbucks and I didn’t, does anyone know why I wouldn’t when it says the TrialPay thing on the top and no swagbucks have been credited to my account, who do I to try and get them? Thank you so much for explaining that to us. It was very helpful and I got the groupon my swagbucks!! You rock!